Caribbean Poker is another great game that is found throughout land based casinos, online casinos and now, mobile casinos. I found this game at Gossip Slots, don’t let the name fool you, they offer a couple of different table games for players who visit using an Android device. To access the site on the mobile platform, I visited the Gossip Slots website from my Android phone where I saw the log in page as well as the cashier and then below that the games that were available. Overall, your choices range from slots to table games like European Roulette and various forms of poker. When visiting the Caribbean Poker game, you will see a loading screen which takes just a few minutes to complete, this screen is seen every time you visit the game, even if you have seen the game before from your device. 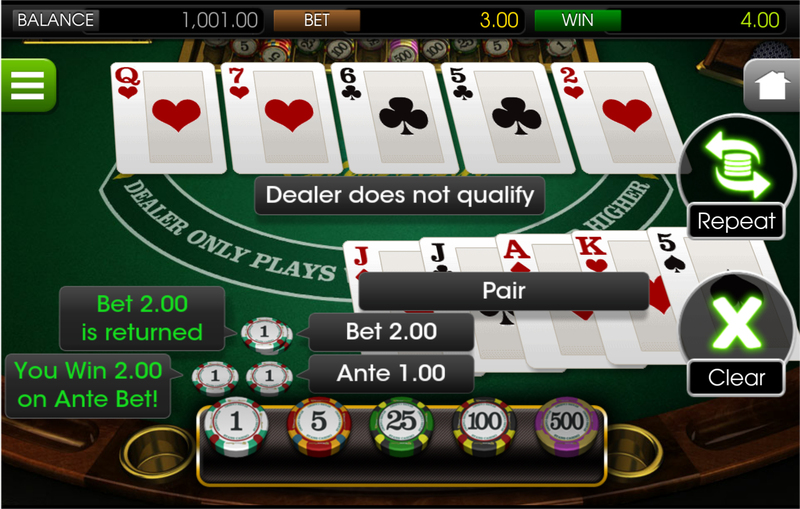 From there, like with any Gossip Slots mobile game, you will see the balance information as well as the win and bet information at the top of the screen. The game looks and behaves just as a land based or online casino’s Caribbean Poker game would so that players can easily get the hang of this game. The great thing about using a mobile casino is that players can go at their own pace, unlike in land based casinos if a player doesn’t quite get the hang of the game, they can take their time to map out their next play. Caribbean Poker has a very easy layout to navigate through, by clicking the house icon, you will be taken back to the Gossip Slots main page which gives you the opportunity to check out more games or make a deposit. Unfortunately, you will have to start the Caribbean Poker game again starting from the loading screen.